By the 1950s, scientists were in hot pursuit of the origin of life. Around the world, the scientific community was examining what kind of environment would be needed to allow life to begin. In 1953, Stanley L. Miller and Harold C. Urey, working at the University of Chicago, conducted an experiment which would change the approach of scientific investigation into the origin of life. The gases they used were methane (CH4), ammonia (NH3), hydrogen (H2), and water (H2O). 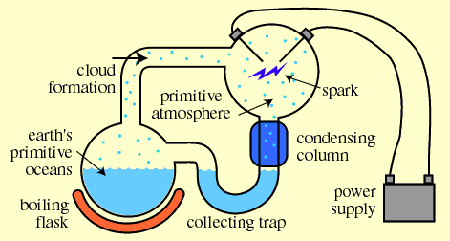 Next, he ran a continuous electric current through the system, to simulate lightning storms believed to be common on the early earth. Analysis of the experiment was done by chromotography. At the end of one week, Miller observed that as much as 10-15% of the carbon was now in the form of organic compounds. Two percent of the carbon had formed some of the amino acids which are used to make proteins. Perhaps most importantly, Miller’s experiment showed that organic compounds such as amino acids, which are essential to cellular life, could be made easily under the conditions that scientists believed to be present on the early earth. This enormous finding inspired a multitude of further experiments. In 1961, Juan Oro found that amino acids could be made from hydrogen cyanide (HCN) and ammonia in an aqueous solution. He also found that his experiment produced an amazing amount of the nucleotide base, adenine. Adenine is of tremendous biological significance as an organic compound because it is one of the four bases in RNA and DNA. It is also a component of adenosine triphosphate, or ATP, which is a major energy releasing molecule in cells. 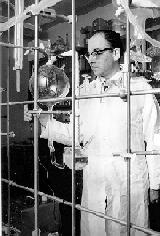 Experiments conducted later showed that the other RNA and DNA bases could be obtained through simulated prebiotic chemistry with a reducing atmosphere. These discoveries created a stir within the science community. Scientists became very optimistic that the questions about the origin of life would be solved within a few decades. This has not been the case, however. Instead, the investigation into life’s origins seems only to have just begun. There has been a recent wave of skepticism concerning Miller’s experiment because it is now believed that the early earth’s atmosphere did not contain predominantly reductant molecules. Another objection is that this experiment required a tremendous amount of energy. While it is believed lightning storms were extremely common on the primitive Earth, they were not continuous as the Miller/Urey experiment portrayed. Thus it has been argued that while amino acids and other organic compounds may have been formed, they would not have been formed in the amounts which this experiment produced. Many of the compounds made in the Miller/Urey experiment are known to exist in outer space. On September 28, 1969, a meteorite fell over Murchison, Australia. While only 100 kilograms were recovered, analysis of the meteorite has shown that it is rich with amino acids. Over 90 amino acids have been identified by researchers to date. Nineteen of these amino acids are found on Earth. (table showing comparison of Murchison meteorite to Miller/Urey experiment) The early Earth is believed to be similar to many of the asteroids and comets still roaming the galaxy. If amino acids are able to survive in outer space under extreme conditions, then this might suggest that amino acids were present when the Earth was formed. More importantly, the Murchison meteorite has demonstrated that the Earth may have acquired some of its amino acids and other organic compounds by planetary infall. If these compounds were not created in a reducing atmosphere here on Earth as Miller suggested, then where did they come from? New theories have recently been offered as alternative sites for the origin of life. This entry was posted on donderdag, februari 2nd, 2006 at 09:58	and is filed under Biology. You can follow any responses to this entry through the RSS 2.0 feed. You can skip to the end and leave a response. Pinging is currently not allowed.